Mix the turkey, egg and seasoning mix. Form into 12 patties. Chill until ready to grill. Grill on top rack, flipping once. Grill time will vary depending on your grill, temperature, rack height, etc. (Mine run about 12 minutes.) Be sure to fully cook the patties, due to the poultry. 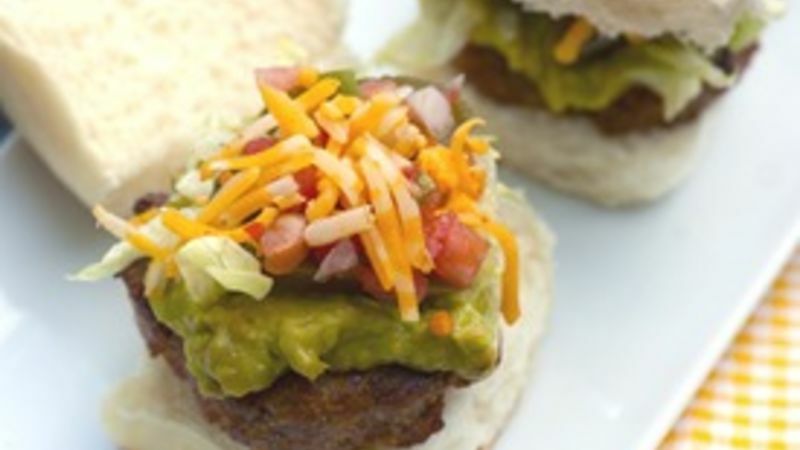 When done, remove from grill and place each patty on a bun and top with taco fixings as desired. My husband has a reputation. It’s not what you think – in our neighborhood, he’s known as the guy that loves to host slider parties. As is often the case, Jeff started out small, with offerings like Bacon double cheeseburger sliders. But that wasn’t enough to quench his or our guests insatiable slider yearnings. He moved on to Bison BBQ Bleus (bison, barbeque sauce and blue cheese) and Thai Chicken sliders (peanut sauce, pepperjack cheese and spicy slaw) that were outstanding. Definitely grill these on the top rack to keep them moist. Time on the grill will vary based on your grill, the rack height and the temperature. Make sure they are cooked through, due to the poultry. Then, dress up the burgers with your favorite taco fixings and serve to your delighted guests!